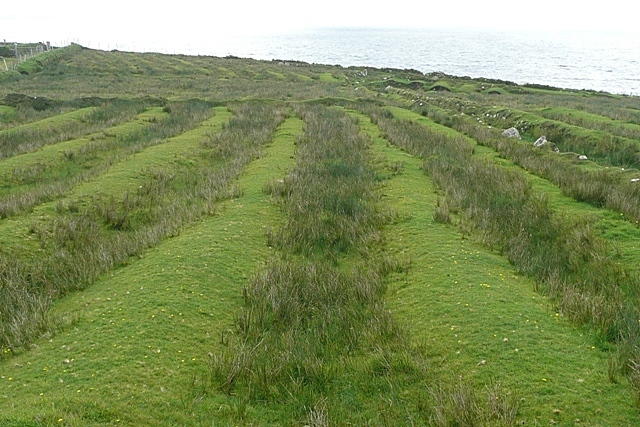 "Lazy beds" is the disparaging name given to these ridge and furrow patterns of potato beds seen over much of the West of Ireland. The British used to say "all the Irish ever do is grow potatoes in their lazy beds". The potatoes would be planted in the middle of the ridges and earth scooped up from either side to cover them and thus provide drainage ditches, always following the slope of the hill. Despite not being used for many years they can still be clearly seen in many places. This page has been viewed about 450 times.